Sahara Sailor tactical pen, with rugged Aircraft Aluminum body, features a stylus tip allowing you to select, sketch, draw, take notes on most of touch screen devices. It can also be used as a normal pen with high performance, and as a self defense pen getting you out of trouble. This anti-skid tactical pen has a multi-use tool including a bottle opener, serrated edge, flat head and other part, which meet most of your needs. Lightweight and pocket clip design keeps the pen handy. It's great for your EDC. Crafted with Aircraft Aluminum, the heavy duty tactical pen features writing, outdoor surviving, car emergency window breaking and more. Perfect for home office or outdoor for use as a pen or as a self defense pen. 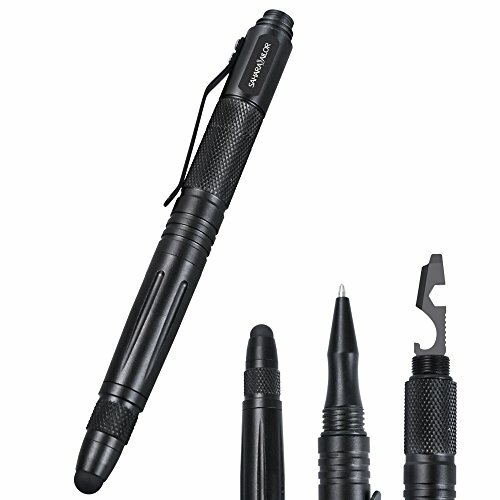 With Tungsten carbide striker, the tactical pen can break glass and get you out of trouble. Great to have one in car in case of need. A stylus tip for kindle, iPhone and touch screen devices; black ball point pen works with high performance. Detachable and practical multitool consists of a bottle opener, flat head screwdriver and serrated edge. Size: 5.9'' overall length, 50g. This tactical pen also comes with 2 extra refills. Perfect for everyday use and traveling. If you have any questions about this product by Sahara Sailor, contact us by completing and submitting the form below. If you are looking for a specif part number, please include it with your message.